Statue of Abraham Lincoln at President Lincoln's Cottage in Washington, D.C. The National Trust's connection to President Abraham Lincoln runs deep. We're proud to co-steward President's Lincoln's Cottage in Washington D.C., and our HOPE Crew program has worked to restore his boyhood home. 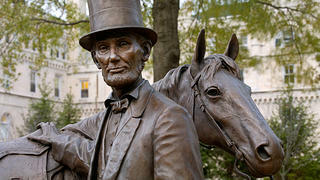 Is there a lover of history, presidents, or "Honest Abe" himself in your life? A search of Amazon.com uncovers over 40,000 books about or relating to Abraham Lincoln, but don't get overwhelmed as you look for the perfect gift. We've handpicked a few of our favorites, from robust biographies to less reverent tomes, to help guide you towards holiday success. Sometimes the best way to learn about someone is through their own words. Thankfully, in the case of President Lincoln there is no shortage! This collection of his speeches and writings spans 1859-1865, and includes more than 550 speeches, messages, proclamations, letters, and other writings—including the Inaugural and Gettysburg addresses. "Washington was a typical American. Napoleon was a typical Frenchman, but Lincoln was a humanitarian as broad as the world. He was bigger than his country—bigger than all the Presidents together." Complete with 55 of authentic recipes from 1820 to 1865 updated for the modern kitchen, this culinary biography even includes a chapter on President Lincoln's Cottage. Learn how barbecues were served without the aid of paper plates, cups, and napkins; speculate about Lincoln's favorite childhood gingerbread recipe; and more. For the younger reader, this inspiring (and entertaining) biography by Brad Meltzer is the ideal read. It follows the life of Lincoln from childhood to the White House. The illustrations by Christopher Eliopoulos are a charming part of the book, bringing the stories to life. Seth Graeme Smith takes a rather different view of President Lincoln in this comic horror exploration of an alternate history in which Lincoln had duties far beyond those of a normal president. This book is not for the faint of heart (nor for the serious historian). Did we miss a title? Do you have a book you'd recommend? Let us know on Facebook or Twitter. By purchasing any of these products using the links on this page, you'll be supporting the National Trust. A small portion of the sales comes back to us to support our work. Looking for other ways to support preservation over the holidays? Consider giving a gift membership to the place-lover in your life.